This article shows the current trend that is happening with governmental relationships between various countries with China from all around the world. Nepal is not the only country doing this. China is the second biggest economy in the world and many countries depend on China for the trade, growth, economy, investment, infrastructure and so forth. Hence it is only logical that a country like Nepal establishes this kind of bilateral ties with China which has mutual benefits for both countries. The Tibetan community in Nepal are guests in their host country. They depend on the kindness of Nepal for their livelihood, a place to stay and a place to practise their religion. Nepal is a small and poor country, so they depend on bigger neighbors for assistance. Therefore, the Tibetans in Nepal should not engage in activities that will jeopardize the good ties between China and Nepal. After all, what do the Tibetans give back to Nepal and what would Nepal gain if they side with the Tibetans? The answer to these cold hard facts is evident with this latest development as reported in this news article. It’s high time that the Tibetan community starts giving back to their host country of Nepal. Due to the freedom and rights they have enjoyed in Nepal for 50 years now, they are doing very well. The Tibetan community in Nepal should not even be considered refugees as their living standard is higher and if not better than the average Nepali. They should be raising funds internationally for the betterment of Nepal by building hospitals, schools and other health care facilities to help their fellow Nepalese. Tibetans themselves should open their own purse strings to contribute back to Nepal. In fact the majority of the Tibetans in Nepal carry Nepalese passports and travel in and out of the country internationally without issues. A well known Tibetan/Nepalese is Lama Zopa Rinpoche who carries a Nepalese passport and has all the benefits of any Nepalese citizen. Like Lama Zopa Rinpoche, many Tibetans have full privileges as any other citizen. It is very important now for the Tibetans in Nepal who have gained so much living in Nepal to contribute back to the Nepalese people and nation and not create disturbances for Nepal to receive aid for the betterment of their country especially after the destruction of the earthquakes. DHARAMSHALA, April 2: In a grim political development against Tibetans living in Nepal, the Nepalese Army Chief has assured his Chinese counterpart of not allowing any activities by Tibetans against China on Nepalese soil. General Xu Qiliang, Vice Chairman of China’s Central Military Commission (CMC) met with the Nepalese Army Chief Rajendra Chhettri during the latter’s China visit aimed at increasing cooperation in defense strategy between the two nations. Reportedly, Xu also thanked the Nepal Army for successfully controlling anti-China activities in the land-locked country and proposed further association in exchange of information, humanitarian cooperation and disaster management. 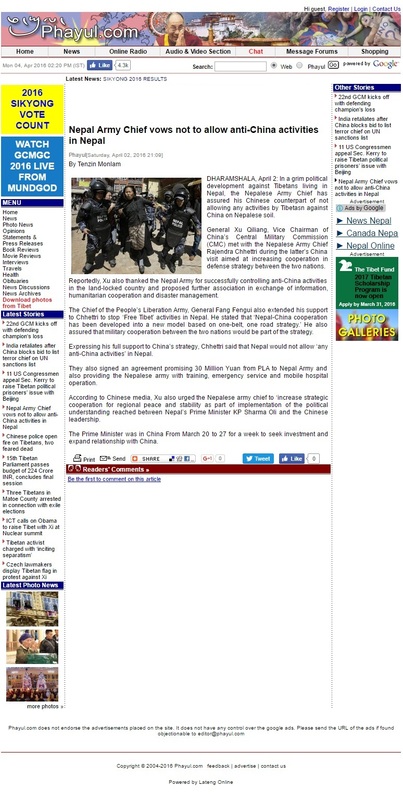 The Chief of the People’s Liberation Army, General Fang Fengui also extended his support to Chhettri to stop ‘Free Tibet’ activities in Nepal. He stated that ‘Nepal-China cooperation has been developed into a new model based on one-belt, one road strategy.’ He also assured that military cooperation between the two nations would be part of the strategy. Expressing his full support to China’s strategy, Chhettri said that Nepal would not allow ‘any anti-China activities’ in Nepal. They also signed an agreement promising 30 Million Yuan from PLA to Nepal Army and also providing the Nepalese army with training, emergency service and mobile hospital operation. According to Chinese media, Xu also urged the Nepalese army chief to ‘increase strategic cooperation for regional peace and stability as part of implementation of the political understanding reached between Nepal’s Prime Minister KP Sharma Oli and the Chinese leadership. The Prime Minister was in China From March 20 to 27 for a week to seek investment and expand relationship with China. Click on the image to read Phayul’s report. Nepal give everything to Tibetan people but Tibetans give noting back to Nepal for ever. In Dec. 2015 China made it a crime to engage in anti Dorje Shugden activities. Now you will see Nepal also make it a crime to engage in both anti China and anti Dorje Shugden activities. Strange how China and Nepal will protect Dorje Shugden followers and who are they protecting them from? 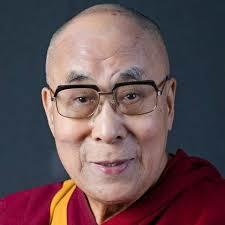 That’s right the so called Buddha of Compassion the hate monger, the 14th Dalai Lama. 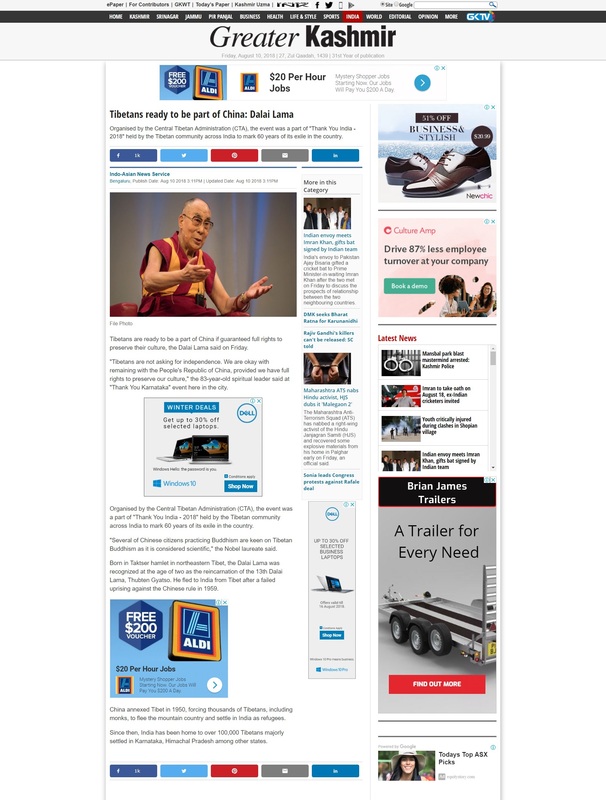 The political noose is quickly tightening around the Dalai Lama. Soon his only friends will be his former employers the CIA and Hollywood. 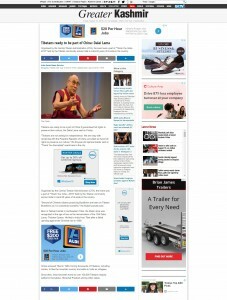 Dorje Shugden wins again and the Dalai Lama loses again. This move is not wholly unexpected among those who are following the regional politics. Given the rise of China as a major world power, this makes perfect sense. In Nepal as with India, the exiled Tibetans have not really integrated into the larger society as a whole, but are considered very insular and Tibet-focused. I’m not saying that keeping their cultural heritage alive is not important, on the contrary, i will support them if they want freedom for their country. But the matter remains that they are in countries who are giving them opportunities at a good life, but the don’t seem to be grabbing the bull by its horns, as it were. The main reason for this has to be their current Tibetan Administration. This Administration is very corrupt, as is evidenced by the current berating received from the State protector deities in trance, and serious concerns raised by international figures such as Congressman Dana Rohrabacher, in relation to the electoral fixing that marred the recent elections. This is just but the tip of the iceberg. The way the CTA controls Dorje Shugden practitioners is another example. This control, insulates the Tibetan peoples and that’s why they have not successfully integrated into either the Nepalese or Indian societies yet. It very sad, if they had done so…i think the Nepalese government would have serious thought twice about this measure. But then again the Nepalese government has no choice, since it’s current neighbors aren’t helping that much either. What a big mess the Tibetan’s have found themselves in! It is important for Tibetan refugees to appreciate all the help they have received from the Nepal government all these while. In addition, they should be independent and contribute towards the growth and prosperity of Nepal. This way, their stay in Nepal will bring benefits to the nation. The Tibetans should be mature enough to understand this logic and how they are relying fully on others for their basic needs. No one owes them anything and they should in return show gratifications instead of creating troubles for their breadwinner. Besides, what benefit do they get from digging their own grave per se? Tibetans should really stop creating problems wherever they go already. They should just focus on working to improve the social welfare and education of their people. They should really stop inciting more hatred into their own people and cause more conflict. For a society that calls themselves Buddhist, there seems to be a lack in the practice. It also shows how desperate they are because their current exile administration… a government without a country have been ignoring their cries. I guess if they put more focus in helping them develop a life outside of Tibet, and give them better education. Perhaps the desperation would be less. Also why will the Dalai Lama not say anything to His people to calm them down? Why won’t He say that to create conflict, disharmony and problems will shorten His life? Instead so easily always lay the blame on DS? Let’s be very honest a frank, no one is going to fight with China or want to… let’s face it, China is now the no.1 superpower nation in the world. Instead of a mice trying to fight with Tiger, it would be smarter to make friends with the Tiger so that the Tiger will then be nicer to all the people inside Tibet. It is the most peaceful and logical solution. It is really high time they do so and stop provoking China and all her allies. It is just great news that the Nepalese army is releasing statements like this to support China and stopping all activities that are anti-China on their lands. It shows that the Nepalese truly support and like what China is doing. China has also helped them in many ways in the times of need for Nepal. Just like what Steve had written, what has the Tibetans or CTA provided for Nepal? They have done nothing for Nepal yet, Nepal has done so much for them. Thus, the Tibetans should be giving back to Nepal by not creating trouble for Nepal and try to help Nepal be good friends with China to improve Nepal’s economy. It is indeed true that many of the Tibetans have a better life then Nepalese. To have said that, it would only be logical for the Tibetans to help the poorer Nepalese by doing a small deed of not creating trouble for them to destroy the relationship that Nepal has with China. I agree with you that more and more countries have become economically depended on and must maintain good relation with China. Nepal is not an exception. China can offer many incentives for other countries to be their friends, what can CTA and Tibetan refugees offered to them. The Nepali government has helped Tibetan refugees for humanitarian reasons, but after 50 years the refugees should assimilate and contribute to their host countries. Instead of promoting anti-China activities (e.g., self immolation) and creating issues with DS practitioners in Nepal, the Tibetans should consider to start thinking on how they can contribute to their host country and assimilate. As I read the article, I kind of feel embarrassed for the Tibetans. Actually, this scenario of being a taker that does not give back is not limited to Nepal but every country that was kind enough to take in the Tibetans in exile. Crudely put, Tibetans are portrayed like parasites who take from their hosts and may even endanger the host. It is sad that this happened. Ultimately it again the responsibility of the CTA. If the Tibetan leadership practiced the Dharma and act graciously and with consideration to others and gratitude, they would take the initiative to give something back to the host countries and communities as leaders of the nation. The leaders do not know how to be leaders and the world is beginning to see through this as the glitz surrounding the Dalai Lama dies down. Even the Tibetan youths who are educated and exposed are beginning to say the same. The days of the CTA is very numbers and this is probably the reason they are bringing corruption to a whole new level: to milk every last drop from the cow before it expires. In the recent Nepal earthquakes we saw how the CTA will not even sincerely help its own people living in Nepal (http://www.dorjeshugden.com/all-articles/features/why-doesnt-the-cta-help-nepal/). In fact, not only will CTA not add any value to those who have been kind to them, they create problems for their host countries. We know this because we have seen how Tibetans abroad have been incensed by the CTA to deny Shugden worshippers their right to religion and we see how Tibetans who are merely guests abuse citizens of the country simply by account of their Dorje Shugden practice. Nepal has no interest in the China-Tibet conflict. Why should Nepal stand by idly for the 30,000 to 40,000 Tibetans to ruin Nepal’s friendship with China and for the Nepali people’s hopes for a better tomorrow to be dashed? I hate to point this out but I think Steve is right. What does Nepal get for allowing and tolerating the Tibetan presence in the country after all these years? The Tibetans are always claiming to seek independence but there is no headway in that direction because the Tibetans are always just talking and thinking about themselves and their independence. There is no gratitude for the host countries like India and Nepal. They don’t have a broad perspective of what brings unity towards their own community considering how harshly they implement the ban on Dorje Shugden. It’s just too bad because they loose out in the longer run and on the bigger purpose of their negotiations with China. Hence, they are finding it harder and harder to secure fresh talks with China. It has reach a point where China seems to be uninterested to resume talks because they are probably waiting for the Dalai Lama to enter clear light and they probably figured everything would fall apart. This is a very good development, Nepal is a great country with great people despite being poor. i wish so much that Nepal can progress greatly and have their infrastructure and economy improved. Nepal does not need the Tibetans, Nepal is very kind to accept the Tibetans, but the Tibetans are so ungrateful to protest against China on their host land and embarrass their host. The trouble-making Tibetans give nothing back but only damages, so it is a great move that the army chiefs of both countries reach an agreement to stop all unnecessary protest. The Tibetans should just be grateful and live their lives peacefully and contribute to Nepal in any way they can, that’s not even Buddhist but basic human courtesy. Good for Nepal leader to think like this n putting their people first . Wish our Tibetan leader think to like this more . Always thinking to themselves first so now many problems are coming to Tibetan people . No point Tibetan people blame to Nepal leader for this rule . This is their country not our country . We forgot the true goal of rangzen we are guest in these countries so we have no right to complain to them abt what we can n cannot say. How do you feel when you have opened up your home and welcomed a guest to stay, and later on that guest tries to create a problem between you and your neighbour? 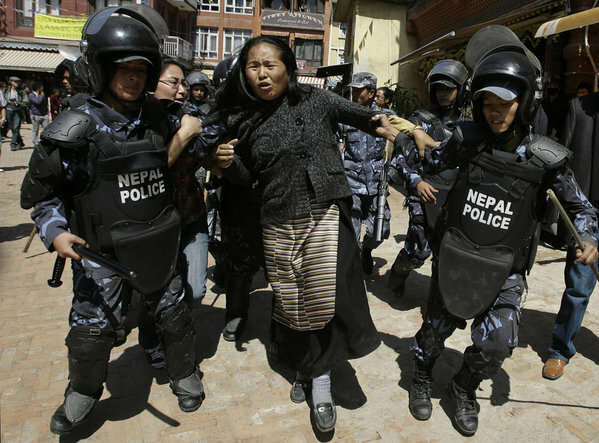 That is the situation with Tibetans in Nepal. The Tibetan community do not have gratitude towards their host, and instead of giving back to their host, they were creating trouble with their anti-China campaigns and activities in Nepal. China’s leaders have been regular travelers to all parts of the globe, cultivated a more cooperative relationship with members of the Association of Southeast Asian Nations (ASEAN), improved ties with Russia and India, and continues to make effort to improve their ties with various countries. In Oct 2015, China’s pledge of foreign aid includes $2 billion to the new South-South Cooperation Assistance Fund, debt forgiveness for least-developed countries, $100 million in military assistance to the African Union, as well as a 10-year, $1 billion “peace and development” fund to support the United Nations. Of course many can see that China’s foreign aid to developing countries, including those in Africa, is indeed un-altruisticn and uses aid as a policy instrument to cement political friendships and facilitate China’s political agenda at multilateral forums, but money is money. What do people/ countries get from support Tibetan administration? Tibetans need to wake up and stop playing the victim card. As time goes on, the trick will not work as more countries and supporters begin to notice the corruption and inefficiency of CTA, especially the recent failings in the recent Tibetan Election processes. This again shows that China is rising very rapidly, most of the countries do not want to mess with China, well as much as you don’t like it, we can’t deny the fact that China is strong. Anti China individuals should really reconsider their actions, it is impossible to fight against billions of people. Nepal is doing the right thing, even if China wasn’t as powerful, those people who live in other peoples’ country should behave politely and try not to create trouble. The country is kind enough to provide the necessary protection and necessities therefore those people who live there should try to create harmony instead of more fighting amongst the society. It is quite embarrassing that the Tibetans who received so much help and support don’t give back. Indeed the Nepalese Government has done right to not allow anti-Chinese activities. The Tibetans must contribute to their country. The chances to get Tibet back is very little. It is better to reach out and support their fellow Nepalese friends and improve their living conditions. Because socialism is rooted in eternalistic and nihilistic views, wherefrom all the thoughts and emotions arise instead of wisdom and compassion, that comes from a dualistic perception and experience of reality that comes from ignoring the basic freedom of lastingness and non-existence, interdependence, law of cause and effect, essence and nature of conciousness- and spacecontinuum, socialism is in conflict with reality itself and all the other dualistic systems as well as also it only can cause effect suffering like all the other dualistic systems that are all in conflict with reality and eachother because they only effect impermanent luck and happiness that is not freedom and wellbeing at all. Therefore only ones own wisdom and compassion can cause and effect freedom and wellbeing. There is only the one world order of Samantabhadri and Samantabhadra, and nobody can escape their kindom. If you want effect freedom and wellbeing, you follow the one and only law of cause and effect of this one and only kingdom of space or you create your suffering. There is only one law and kingdom, the law and kingdom of the limitless space that nobody can change, manipulate or destroy. Many people may condemn Nepal army for kowtowing to China but I think we forget while we sit on our high horses judging others for their choices, that Nepal does need help to rebuild their country. So far I do not see any other countries putting their hands up to help except China, so of course there are certain things required which is only fair especially when it is to bring more peace to the Nepali people. Tibetan should feel grateful they even have a place in Nepal where they can easily integrate and instead they should bring peace on to Nepal instead of creating more havoc which create more problems for themselves and also for Nepal. Appreciate what you have would be my advice and try to live in peace especially when you are living in someone else’s house. I wish this will also help to put a stop to the harassment Shugden practitioners face in Nepal. Makes one wonder how come wherever there are followers of HHDL, there is always no peace and always there is trouble? What kind of practice do they learn from HHDL? Nepal and India had given refuge to the Tibetans-in-exile without asking for anything in return and yet CTA, who is the governing body of Tibetans-in-exile, had not even bothered to repay their kindness in any form but instead had always put their host countries in discomfort. With over 50 years of donation and sponsoring, the CTA could have really built up the welfare of their people and integrated them into building up of their host countries. Instead they chose to practice manipulation, corruption and selfish agendas to fatten their own lives. They create chaos, discrimination and segregation by blaming and putting the ban on Dorje Shugden practices, which can’t loose them international support fast enough. With China’s economical power increasing and their growing stability in governing, they are bound to have countries seeking their alliance. China had been known to support many poor countries economically and financially, irregardless of these countries remaining loyal or not. In face of this sentiment, the Dalai Lama and CTA will have very little bargaining power for exodus back to Tibet. The only way forward would be to cede any political powers and to live the life as normal citizen of China. The ban on Dorje Shugden certainly have done nothing to improve the move back to Tibet. The Dalai Lama and CTA should remove the ban immediately and change their policies to more people-centric or they will remain stateless and unwelcome in current countries.